Just weeks after the turn of the year W.AG publishes the new plastic case catalogue for 2017. The simple look of the 2017 catalogue is in line with the new TWIST case range, embodying a minimalist design with purist design elements itself. Firstly the reader gets an overview of what all these elegant W.AG plastic cases and boxes can be used for; including applications in e.g. medical technology, metrology, tool or toy industry, which not only have an interesting print, but also offer smart inlay solutions “made by W.AG”. The new plastic case TWIST debuts on page 12 of the case catalogue. Here the reader will find a number of facts on the philosophy and strengths of the modern design case and learn more about the innovative features of the TWIST. These include a reliable lid stay, practical shoulder strap and the option to customise the case with embossed logos on the locks. As with all previous catalogues, the cataloguein DIN long format includes the latest decorating examples of screen and pad printing as well as the ingenious in-mould labelling process. 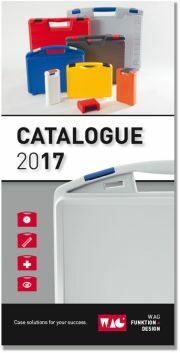 Take a look at the world of plastic cases and conveniently download the brand new catalogue in PDF format! The W.AG team hopes that you will enjoy reading the new catalogue!